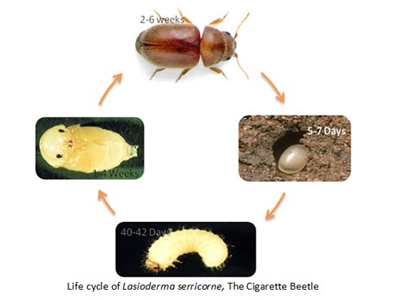 Lasioderma serricorne, commonly known as the cigarette beetle, cigar beetle, or tobacco beetle, is an insect very similar in appearance to the drugstore beetle (Stegobium paniceum) and the common furniture beetle (Anobium punctatum). All three species belong to the family Anobiidae. L. serricorne is around 2–3 mm long, and brown in colour. The beetles, which can fly, live 2–6 weeks and do not feed as adults. 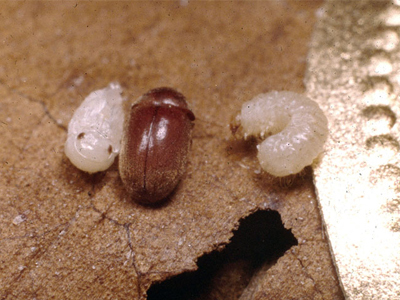 The female beetle lays around 100 eggs loosely on the substrate to be fed upon. 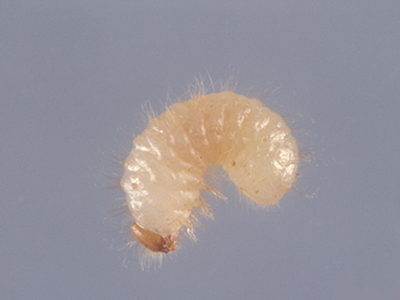 The larvae are active and will move around on and bore into the product, feeding as they go. The complete life cycle takes 26 days at 37°C and 120 days at 20°C. L. serricorne cannot tolerate the cold; adults die within 6 days at 4 °C, and eggs survive 5 days at 0–5 °C. The beetles carry a symbiotic yeast, Symbiotaphrina kochii that is transmitted to the next generation superficially on the eggs and carried internally in larvae and adults in the mycetome, a specialized organ that is linked to the gut. The yeast cells assist in the digestion of less nutritious foods, supply needed B-vitamins and sterols, and provide resistance to certain toxins. The most visible signs of cigarette beetles are the adults, holes in packaging and debris coming out of packages. Adults are active fliers and are observed as small brown beetles. As they exit from infested materials, they often chew their way free, which leaves holes in the packaging. As the larvae continue to feed, fine particles of debris come from the packaging. Insect monitoring traps are available for L. serricorne, which contain specific pheromones to attract male beetles, and help detect and monitor infestations. Infested bulk tobacco in the form of bales or hogsheads can be fumigated using phosphine. Methyl bromide is not recommended for cigar tobacco since it can produce off odours in the product. With phosphine dosage rates are one gram of phosphine (equivalent to a 3-gram table) per m3 for 5 days at 12–15 °C and 4 days at 16–20 °C and 3 days above 20 °C. For localized or household-level infestations the preferred control measure is to find the infested product, dispose of it.